We have these great tote bags for sale. Very handy for use at home or when you're out and about. larger pocket. 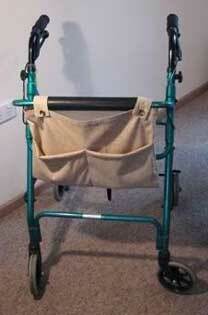 They are easily accessible and fit neatly on the walkers. Great for storing essentials for shopping, keys etc. Just $10 per bag plus $5.50 postage and handling or you can collect one at our next meeting. Are you always losing your keys/phone/memory card ? Are you tired too of trying to explain our condition ? Why not use our wonderful new, strong SCAA lanyard ? Minimum price is just $3.00 - BARGAIN!!! The sale of these items is supporting your organisation! !